“During my early days of studying in Darul Uloom, the the Darul Uloom was located so far away from the city center that it was like an island cut off from the rest of the world. I would go home on Thursdays, which used to be holiday. Our house had 5 rooms out of which 2 contained cupboards filled with books. My holiday routine was to browse through those books. I would open a book, read a few pages then move on to another book. For some books I would only read the author’s name and few pages, some I would read half and some books complete. All praise is for Allah (Alhamdulillah) I read all kinds of books, including about Seerah, Tasawwuf, etc. After reading all those books I say from the depth of my heart that the books which benefited me most were the Spiritual discourses (Mawaiz) of Hakim al Umma Maulana Ashraf Ali Thanwi (Allah have mercy on him). My respected father used to encourage me to read the Mawaiz but initially I used to be more interested in literary texts. Also, I would find the language of the Mawaiz too difficult and sophisticated. It wasn’t that I would not understand the language, but I would find it too sophisticated for my taste. I would read them sometimes, but would not find them interesting. One day I told my respected father the following state of my heart: “Among my elders, the amount of affinity and fondness I find in my heart for respected Shaykh al-Hind (i.e. Maulana Mahmudul Hasan) and Maulana Anwar Shah Sahab Kashmiri is more than for Hakim Al Umma (Allah have mercy on them)”. 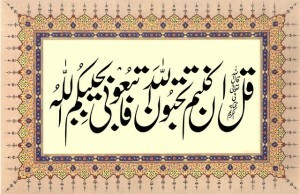 “Taqi miyan (میاں), you are still stuck in the knowledge of alfaz-o-nuqoosh (words and designs). You have not even started to have the concern for correction (islah) of your nafs.” He said this with a sense of longing and regret. This is despite my respected father’s deep attachment to those two elders. This entry was posted in A. Reality of Tasawwuf, B. Praise worthy morals, L. Books, N. Advice, Q. Akabir, U. Urdu on July 12, 2018 by 'abd. SubhanAllah, this story is filled with so many lessons for everyone. Please read it with the intention to learn the lessons from the life of Shaikh Abu Abdullah Al-Andalusi (Allah have mercy on him), and also the character of his devoted and loyal students. I pray that Allah grants every reader the tawfeeq to benefit from this and to protect us all from any tests of this sort. Ameen. Note: Since this is not a formal Arabic written entry, the rules of Arabic have not been enforced such as in the name of the Shaykh, etc. In Baghdad, the seat of the Islamic State, was a pious saint by the name of Abu Abdullah Al-Andalusi. He was a well-known scholar and muhaddith and twelve thousand disciples sat at his feet. He knew thirty thousand ahadith by heart, and could recite the Quran in all the various modes of Qiraat. On a certain occasion he was going on a journey and was accompanied with a large crowd of attendants among whom were the well-known Junayd Baghdadi and Shaikh Shibli Rahimahumullah. Shaikh Shibli continues the story: Our caravan was traveling along safely and comfortably with the grace of Allah, until we passed by an area where Christians were residing. When we reached the Christian village, we searched for water but could not find any. We went about the village and discovered that there were many churches, temples of sun-worship and synagogues. Some of the people worshiped idols and others prayed to the cross. We were amazed at their condition. We passed all this and reached the outskirts of the village where we found a well and a few girls drawing water for people to drink. Among these girls was one who was exceedingly beautiful. She wore a gold necklace around her neck. When Shaikh Abu Abdullah saw her the color of his face changed. The Shaikh asked the other girls who she was. The Shaikh sat down with his head bent forward and remained silent. For three days he did not eat or drink. He would only perform his Salaah. His disciples and companions did not know what to do or say. Saying this the Shaikh began weeping bitterly. “Proceed and leave me alone. My fate has been sealed,” he told them. We were astonished. We begged Allah for His protection and we cried until the land beneath our feet became wet with our tears. We returned to Baghdad. When the people heard of our return, they arrived in large numbers at the outskirts of the city to meet the Shaikh. They saw that he was not with us and asked where he was. We told them the entire story. Many of his disciples died out of grief when they heard of his condition. Others cried in sorrow and disbelief. Many begged Allah to guide the Shaikh to the right path and return him to them. All his places of instruction and preaching were closed down. We remained in this sad condition for one full year. Finally, I, together with a few companions decided to visit the village again and find out how our Shaikh was doing. When we reached the village we asked regarding him and were told that he was in the woods looking after pigs. We asked: “What has happened?” We were told that he had proposed for the girl in marriage. But, the girl’s father had refused saying that her suitor had to meet certain conditions : he had to follow the same religion as her, he had to become a servant in the church and he had to look after the pigs. The Shaikh had fulfilled all these conditions and was currently seeing to the pigs. “With broken hearts and tears streaming down our eyes, we went to the woods to find him. He was standing amongst the pigs. Around his waist was a string of beads. On his head was the traditional Christian hat. He stood leaning on the staff that he once used to lean on when delivering the sermon in the mihraab! When he saw us he bowed his head in shame. We came nearer and said, “Assalaamu Alaikum.” He replied: “Wa Alaikumus salaam”. Then turning towards the heavens he said: “O my Lord, I never expected such treatment from You.” Then he began crying bitterly and appealing to Allah. When the pigs heard our crying they began to rub their heads in the sand and began to yell so loudly that the mountains appeared to wail. Shaikh Shibli says : “I thought Qiyaamah had come.” The Shaikh continued to cry uncontrollably. We could not control our joy and happiness when we saw him. He asked us for some pure clothing which he then wore. He then performed Salaah. We expressed our gratitude to Allah for returning him to us and we asked him what had happened to him. *Mufti Mohammad Shafi (Allah have mercy on him) published the story in Urdu with this tittle. This entry was posted in A. Reality of Tasawwuf, B. Praise worthy morals, C. Blame worthy Morals, E. States, H. Whispering & random thoughts, J. Rights , L. Books, N. Advice, Q. Akabir, T. Tarbiyet, U. Urdu on February 3, 2018 by 'abd. This entry was posted in M. اشعار, U. Urdu on September 3, 2017 by 'abd. This entry was posted in M. اشعار, Q. Akabir, U. Urdu on August 29, 2017 by 'abd. This entry was posted in M. اشعار, U. Urdu on August 15, 2017 by 'abd. This entry was posted in M. اشعار, U. Urdu on July 22, 2017 by 'abd. This entry was posted in M. اشعار, U. Urdu on May 19, 2017 by 'abd. This entry was posted in M. اشعار, Q. Akabir, U. Urdu on March 24, 2017 by 'abd. This entry was posted in M. اشعار, U. Urdu on March 1, 2017 by 'abd. This entry was posted in H. Whispering & random thoughts, M. اشعار, U. Urdu on February 15, 2017 by 'abd.